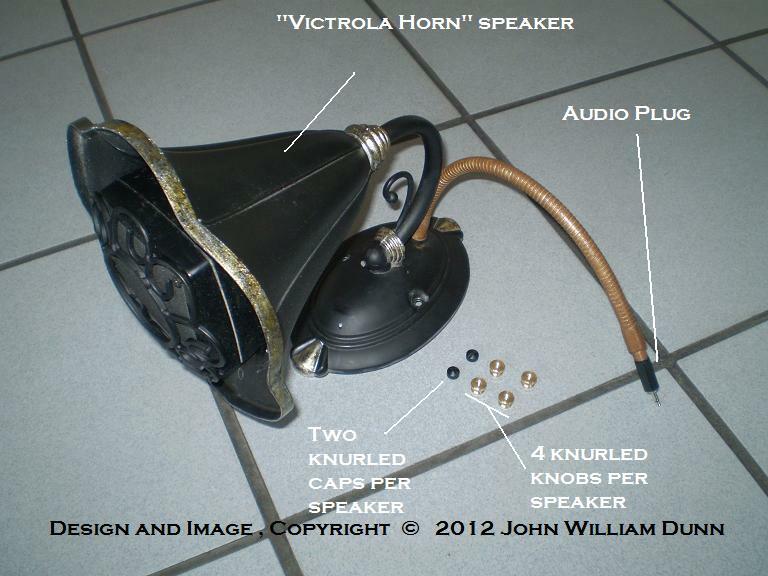 For your perusal, I start a new thread on the construction of the first Neo-Victorian Boombox (that I know of). Dedicated to those of you who never knew that in his youth, President Abraham Lincoln was heavily involved in the Breakdancing scene. For starters, let me say this project grew right out of poverty, with a couple of old computer systems donated by a family member, for me to sell on Craigslist. Among the two systems I had a pair of Altec Lansing ACS 340 amplified speakers (http://www.impactcomputers.com/acs340-2.html), with a central subwoofer and a pair of satellite speakers. I sold one of the systems for a measly $20, and after a month I decided that it was a waste of time, and I kept the other pair. By the way, this contraption is so big, that I had a really hard time taking the photos. The morning glare kept turning the brown felt you see a shade of blue! I had to find an angle to avoid the glare, which explains the odd composition in my pictures. Since I don't have a lot of money, I opted to wrap the white Formica with chocolate brown felt (about $1.60 USD !!). The felt already has a stamped Victorianesque pattern. Since the felt didn't cover the whole area, I went to the hardware shop, and bought two wooden mouldings just to cover the edges of the box. That turned out to be the right thing to do. I used industrial Latex-based glue (again what I had at hand ) to attach all the felt and moulding, and the felt absorbed all the moisture, so the glue cured very quickly and all is rock-solid to the touch. The rest of the assembly was very easy, because the subwoofer is made from particle board, and you can screw anything you want on top of it. I painted and screwed one of the two satellite speaker bases on top of the box, because this houses the on-off button, tonal and volume controls. I'm looking for something to cover the hole on top maybe a cabochon or cameo of some type? 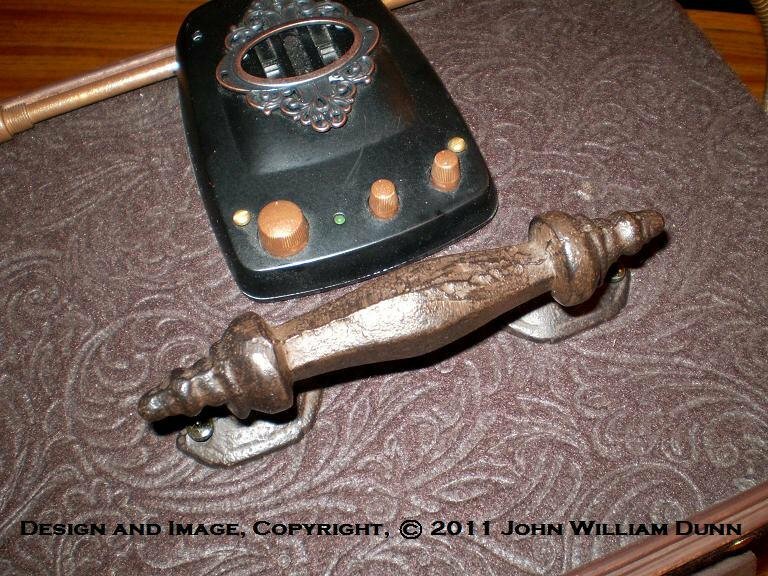 As a handle, I bought a wrought-iron one at a swap meet for $2.70 USD. The only thing I still don't like is the gray shoelaces that I used to run the wires through, as my intention was to give it the "olde-tyme" look. I could use copper pipes or even brass-braided hoses (for washing machines), but that's an expense I'm thinking about (seriously folks, I have to think twice about spending even $5.00 ) That white cable you see has six conductors needed for the tonal control. I will definitely cover that with at least a copper pipe, but the brass braided hoses look mighty fine to me Aaargh! I need a little more money. So ladies and gentlemen, I am open to suggestions. I will try to finish the project soon, but unfortunately it was impossible before Christmas, and it may not be possible before new-year's, depending on money issues. So I bid you adieu for now, wish you a Merry Christmas, and leave you these photos for your perusal. EDIT: This post was heavily edited because a number of photos were lost in time. Inexplicably as well I may have some missing posts in this thread. For continuity purposes I redacted a few paragraphs and used original photos on a new server to match the original post as closely as possible while still making sense. Magical eye tube as equalizer. Might take some heavy soldering, but so worth it. Alternatively, voltmeters in the same role. I agree the grey shoelaces don't quite work, but even just replacing them with dark brown or black laces (and doing the same to the main cable) should look good. Coiled shoe laces may do the trick. They are sold at W*Mart and other big-box merchandisers and are inexpensive. We quite fancy coiled electric cords on Victorian era appliances. Magic eye or cat's eye tubes rule! Thank you, Gentlemen for you comments, I see great potential here, and it's just a matter of resources. By the way let me wish you all a Merry Christmas and/or Happy Holidays. Now there's an idea. I think I saw a website that sold one! If I can't get one, I may try to simulate one with more modern technology (using LEDs and such, as long as I can modulate the light (I know how to build a light bar LED voltmeter). 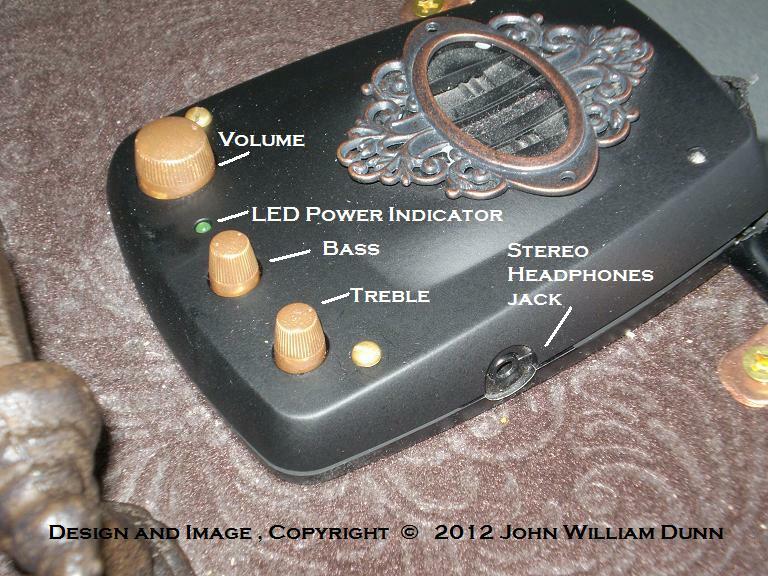 I think the voltmeters in one way or another, will be there in any case, as I am a pathological audiophile. There you go! I may look for those after Xmas. I didn't know coiled shoelaces existed. Thank you, Mark. Yeah, the lamps, that was a message from *above* wasn't it? I simply had to buy them. There were only 5 of those discontinued items left. I came back the next day and they were all gone. Waiting to see results after upgrades. I do enjoy low budget, scratch build contraptions. Thats what I do myself. Suggestion - adding some brass plates- writtings , colors, details.Victorian contraptions were full of that.Hide or paint that plastic on the top, or put in little wooden box . Sorry, this post is of no practical help whatsoever but I just wanted you to know your boombox made me really truly laugh out loud when I saw it, it is everything I expected and so much more, utterly delightful, stunning and gorgeous. 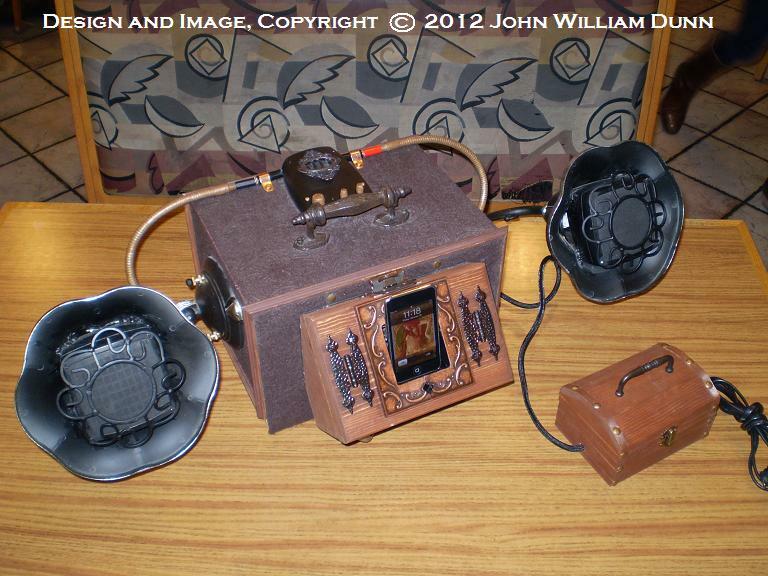 I hereby necromance this thread, on account of the recent tidings regarding the Victorian Boombox project. I must say the Boombox has turned out to be quite the prodigal son (daughter? 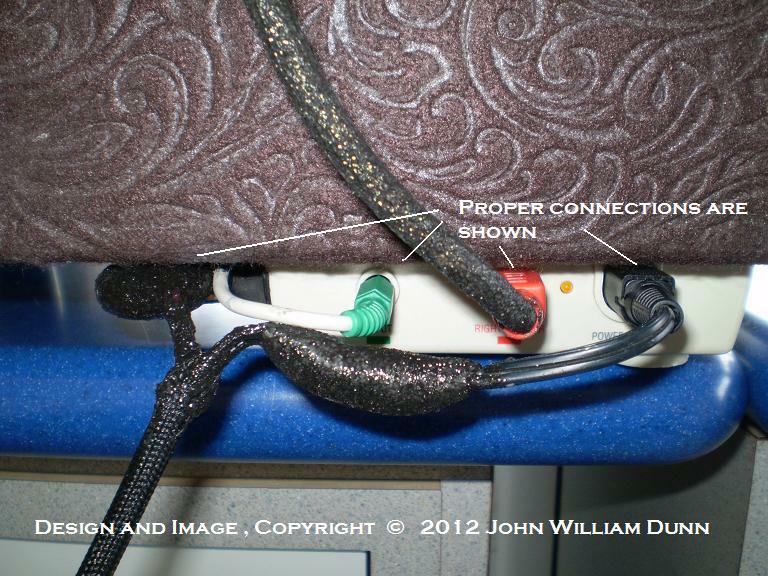 ), having been modified (see pictures below), and damaged during transit to the other side of the country Whew! Quite an adventure and still I haven't heard the end of it yet. 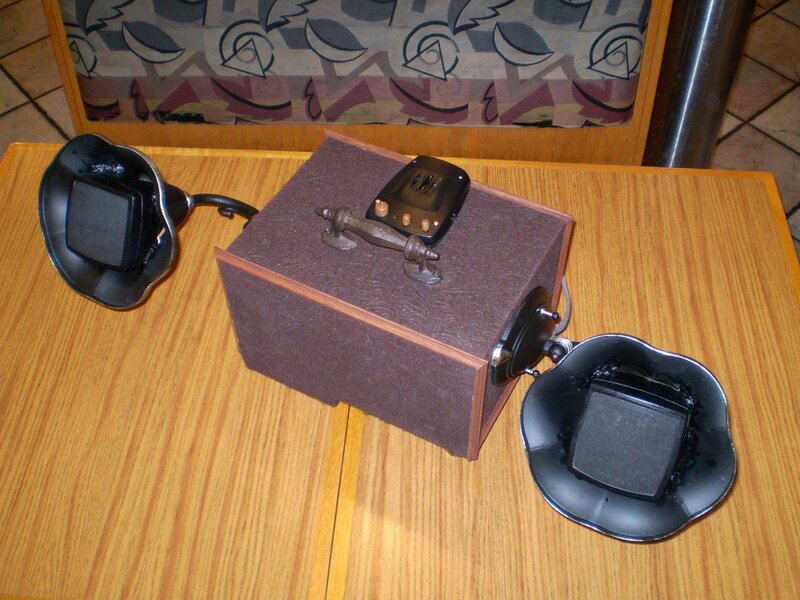 This is what the boombox looked like in its first iteration V. 1.1 BEFORE I would have even considered shipping the darn thing - and I realise now I had never updated this post on those changes. To make a long story short, the first iteration involved adding one of those cheap craft boxes to fashion a dock of sorts for my iPod. At that point it was a very simple receptacle connected to an Apple plug, Nothing else... 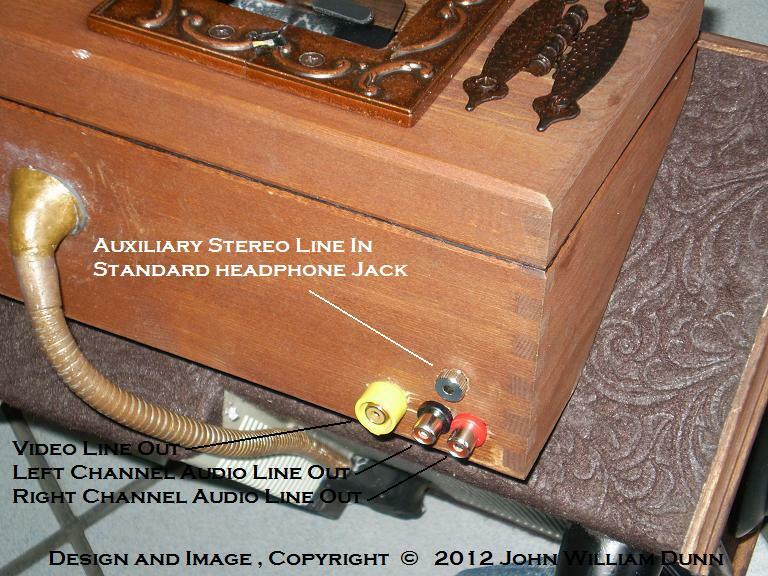 The wires simply led to the "line" level input of the amplifier. I found some sort of "cabochon" from the local craft store, with the idea of adding a logo on top. What I did afterwards was to replace the dreaded shoelaces with flexible lamp "necks" which I painted with Rustoleum epoxy paint. I did the same thing to the cable leading to the "dock." I then simply attempted (not very well, I confess) to paint the white cable leading to the tonal control box. I knew that the arrangement above presented a real risk of the cables being torn out by accident. And once I considered the possibility of selling the boombox (or a series of them), I realised I simply HAD to make them detachable. How would I ship it otherwise? 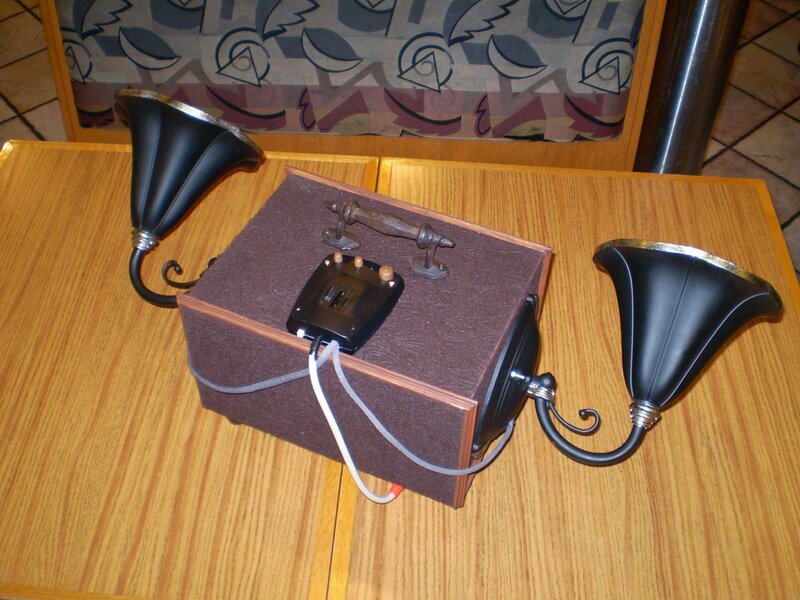 The lamp shades which house the midrange/twitter speakers have always been detachable, but the cables were not. The idea was to divide the Boombox into two or three packages, and at least I can say that part of the plan went accordingly. 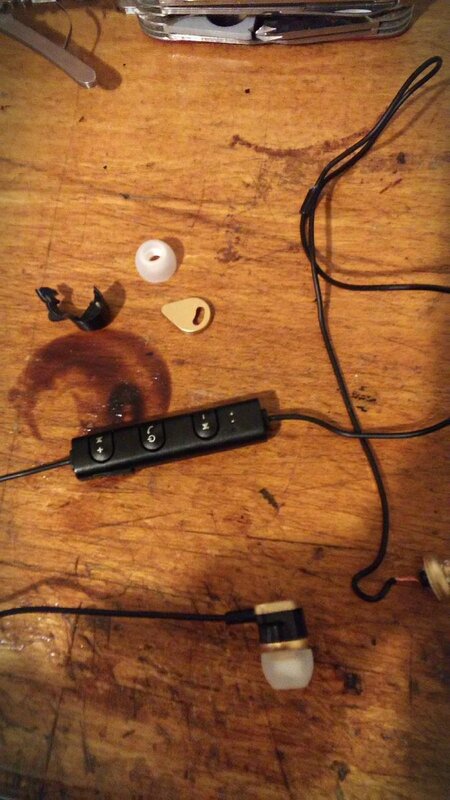 Quite an easy feat I used 1/8" monaural phono (headphone) plugs and some epoxy to make detachable “cables." The base of each aluminium lamp housing the mid-range speakers is unchanged save for a couple of fancy brass knurled knobs. A nice change to the “Victrola Horns” was the addition of a wrought iron-wire grilles (actually a modified pair of candle holders I fetched at Hobby Lobby); this fixed a problem that had vexed me for a long time (how to make a nice grill). I think the black iron is in keeping with the design, and I have heavily emphasized this with the decorative hinges at the front. The biggest change for the Boombox happened at the front wooden box housing the iPod dock - a commercial dock capable of a sound/video output and also the power charging function. I knew that I wanted more and customers online were asking me whether I could somehow incorporate iPhone/iPod docks into my amplifiers (you got to evolve with the times...). I found a Radio Shack (Tandy Corp.) unit, with line level output composite / RCA jacks (Left/Right/ Video). 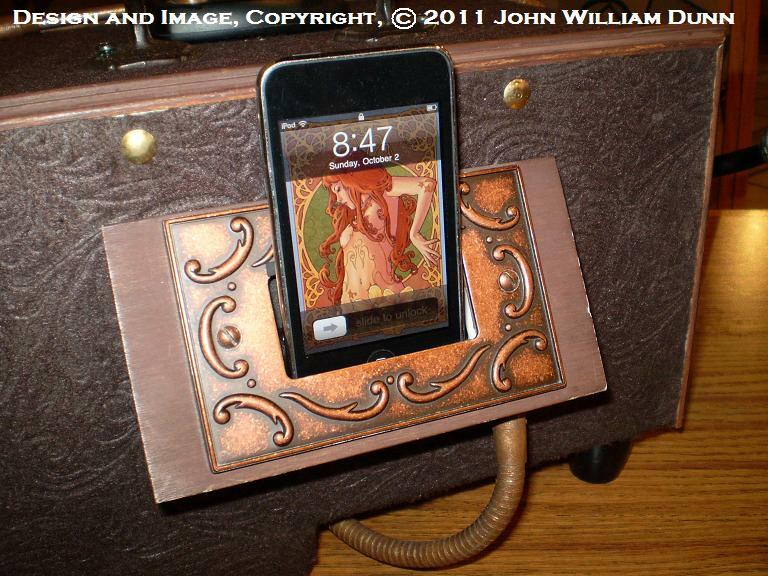 While a discontinued model, this iPod dock proved to be quite elegant and versatile. So I took a larger craft box and ripped off the old wooden box, to accommodate the new setup. The new box was much bigger, but somehow it looked a lot better. With a new larger box I was able to fit the RS dock, and preserve a hinged lid where the new "copper" bezel is mounted. 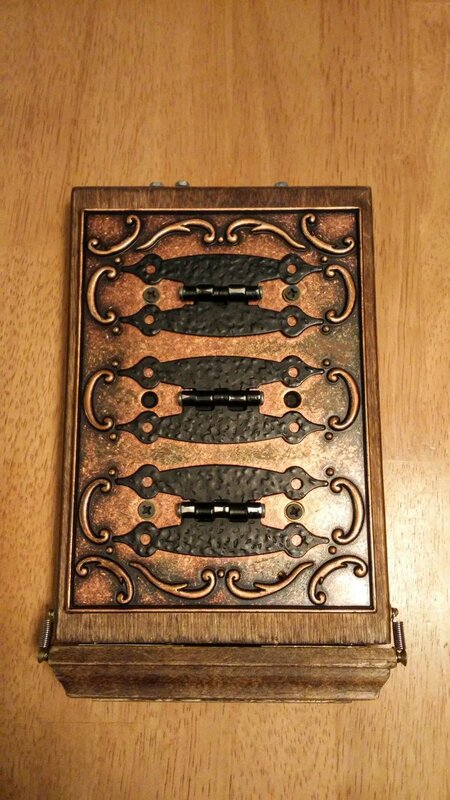 I discarded the small brass hinges and replaced it with a single large-size springed cabinet door hinge; I thought that ought to be strong enough to keep the lid in it’s “open” position. The "bezel" is in fact a set of two wall switch plates, cut and adapted to fit a standard iPhone. Should the Apple device not fit through the bezel, the whole lid can be raised to reveal the Radio Shack iPod dock and an elegant "upholstery" made of felt, both in cranberry/apple-red and black/white colours. I guess I could have used an Apple cable arrangement, instead of the whole dock, but this dock featured a remote control and a smoke-coloured acrylic mounting with a spring, and it boasted universal compatibility with older iPod models. Plus you could use it as a base to charge the phone. The electrical setup is most interesting, as I found out that the line level output of the iPod dock was not powerful enough for the Altec Lancing amplifier. One milliwat at one volt RMS will give you a nice sound, but only if you crank the Altec Lancing all the way up, so that's not good enough. You see, the amplifier was designed to be connected to low-power amplified setups like computer motherboards and laptops (5 watts and up, I imagine). No matter, I thought, analog audio technology already was very advanced by the mid 1980's, so just about any chip you can get your hands on will have a nice frequency response chart. I disassembled a pair of Logitech amplified speakers and scavenged a miniaturized stereo pre-amplifier to serve as buffer between the dock and the Altec Lancing amplifier. A big red switch allows you to choose between a direct auxiliary input or the Logitech/Radio Shack preamplified signal from the iPod dock. So now you have three power supplies to contend with; a 13 VAC power transformer for the Altec Lancing, a 12VDC power transformer for the iPod dock, and a 5VDC unit for the Logitech pre-amplifier. 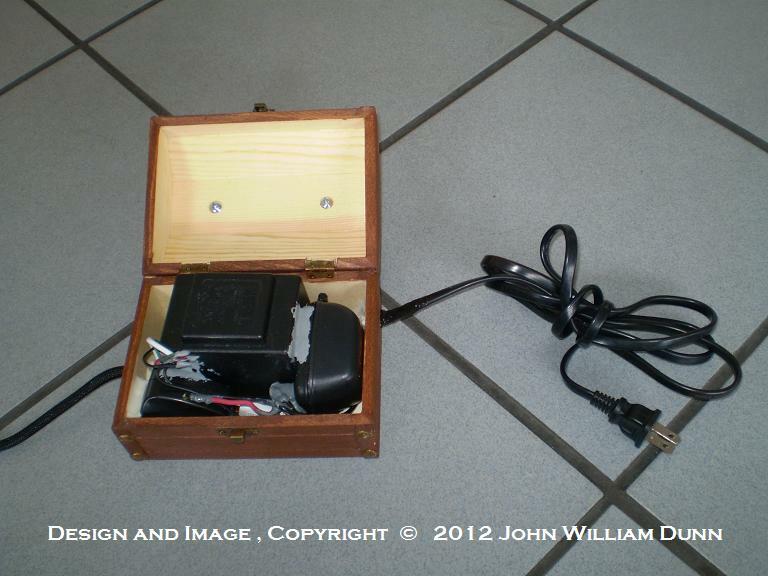 I ended up soldering them together and housing them inside a quaint little chest (Galvanic Power Unit). With a handle for convenience. The cables were run through a black vinil (?) cable sleeve that looks almost identical to the old fashioned cloth-wrapped cables-close enough. So ladies and gentlemen, I leave you with these photographs to record the evolution of this project. Like I stated before I still haven’t heard the end of it. That's quite a tale and quite a piece. Nice to see all the detail. Best of luck with it in the future. Great project. Truly wonderful to see what education and innovation can bring to the table, versus a pot of money. Only a measly 34 pounds? I think my original boom box weighed in at more than that. Just leave instructions for the help in proper lifting techniques in order not to damage such a precious device. Optional shoulder padding available? Do not ignore the freedoms of someone else, for eventually you will be someone else! Bwahahaha! 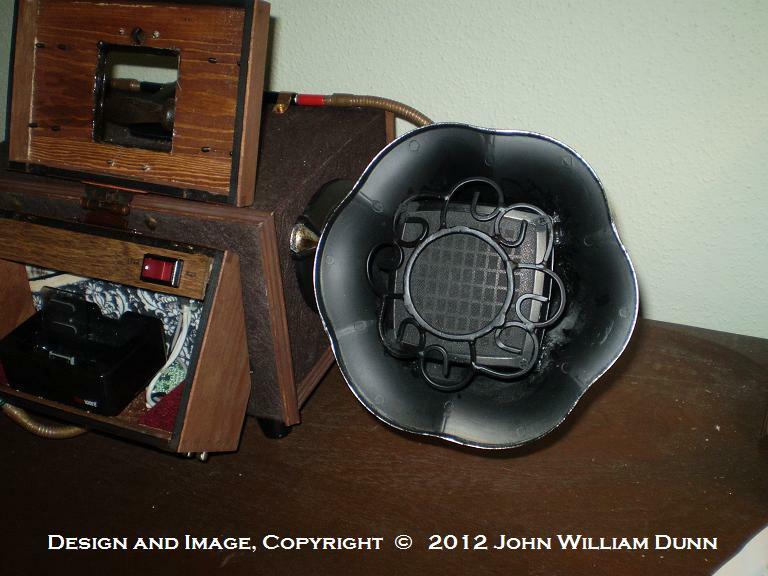 I have succeed in transforming my venerable Viccy Boombox into a Bluetooth Aetheric Device! Well the advantage of this device is that it's basically in iPod Dock connected to a computer subwoofer system by way of a pre-amplifier I concocted (this first generation subwoofer system is used to inputs of ~5 mW and not the 1mW line-level output of the iPod dock so you need a preamplifier so the volume is not too low). I put all sorts of inputs and outputs (video/audio from the dock) because I'm a music freak, so you can connect anything in or out by way of phono plugs or RCA plugs. 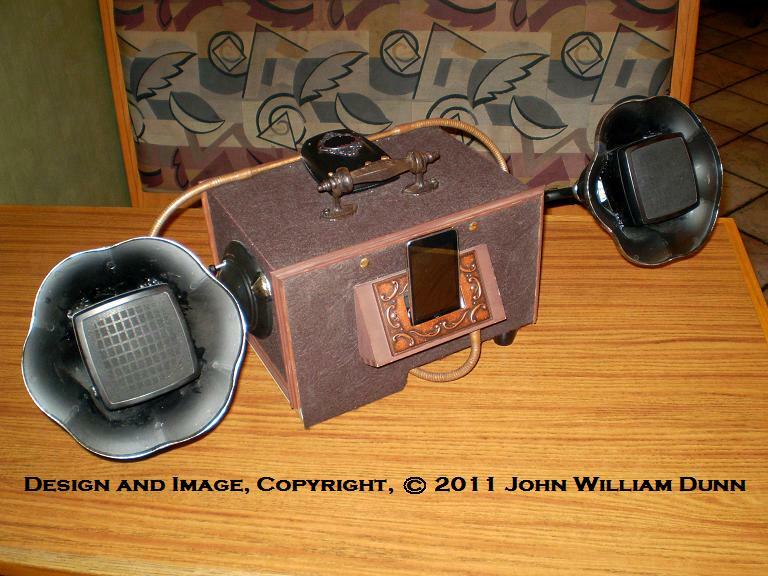 In it;s heyday, I could use the iPod Dock to connect and patch you Tube videos to a television screen. The problem is that my venerable 2nd Gen. iPod Touch suffered a catastrophic failure a couple of days ago... I dropped the thing, and after about 1000 times of not breaking in the span of many years, this time the concrete pavement won the battle. The iPod still works, but looks horrible all cracked up. So yesterday, I purchased a cheapo $7 Bluetooth in-ear bud headset at my local super. Betting that very low power amplifiers (such as this miniature battery earphone device) could be used with the Aux input jack of the boombox, I reasoned that sound quality would be reasonable as long as the output volume is very very low on the side of the Bluetooth device (a typical property of amplifiers is that noise increases with power output, If underpowered, you will also get sound wave clipping from the output because the battery can't keep up with the output required). It was worth a try. The sound quality is actually very good. The volume is not fantastic if the Bluetooth signal is coming from my iPod, as I have to jack up the volume of the amplifier all the way up to get barely decent volume However, the signal coming from my new Android phone is a lot better. You still have to jack up the volume all the way up - but when the Bluetooth volume on the Android device is jacked all the way up, you can reduce the power amp (Boombox) volume to about 85-90 % (power amp output), giving you some leeway. Best of all the quality is 97% of what I would expect. I can still discern a bit of blurriness and noise coming from EM interference coming from the circuits inside the smartphone ( a similar problem happens with an iPod Dock). Now that I know this works it's time to mass produce make the new generation boombox. The one you're looking at above is a huge monster that weighs 30 lbs, has no battery capability, and has a huge separate triple voltage transformer that I often leave at home due to the enormous weight. The sound is awesome, but no one can afford it. For this one-off above, I might incorporate an old 7 inch Android tablet I have, to take the front of the dock you see in the picture. 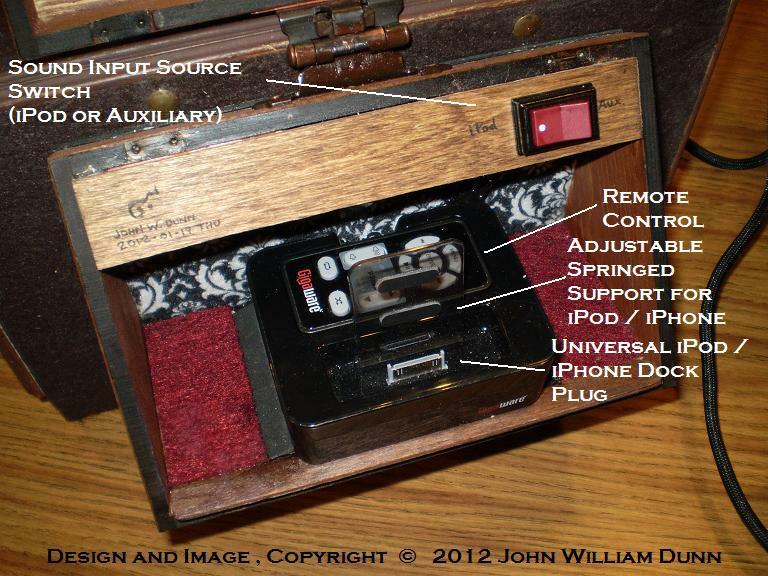 Probably a detachable wooden bumper case attached by way of the same hinge you see in the picture. A sort of "removable tablet." 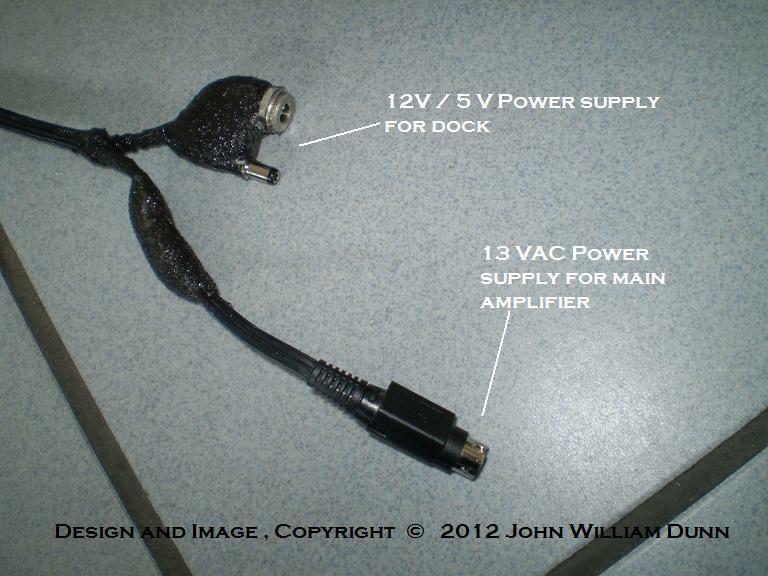 The 5 volt power supply for the dock can be used for the Bluetooth device which will be connected all the time. If I decide to make the mods, I'll keep you posted. In the meantime, my new smartphone needs a new case I think I know how to do that too. 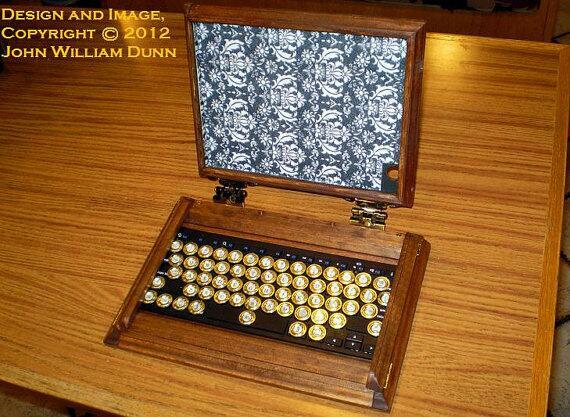 Beautiful modding! I wonder what I could do with those two sets of music lights from the early 80s? 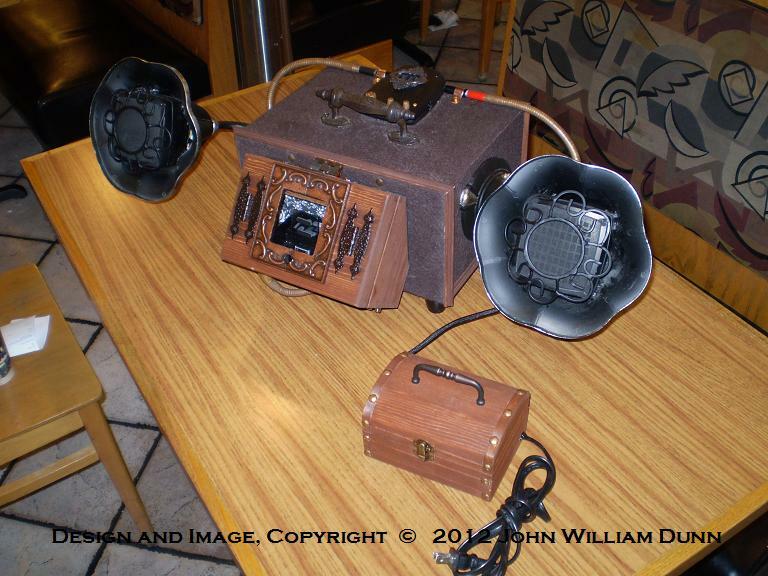 Your monster boom box looks absolutely as though it was made a hundred or so years ago (with the iPod removed, of course ). I hope the formulation of the new mark II bluetooth-as-standard version goes to plan and I'm looking forward to the WiP images. The trick is finding the time to do it. With my new work schedule, I hardly have the time to do anything any more. I spend most of my time commuting on the bus and walking. I even have to finish the silly spats I started. I resolved some of the volume issues by connecting the Bluettoth receiver to the ore-amplifier. When I made the circuits I was lazy and did not use an line level output switch. I just soldered the input connection to the pre-amplifier to the output jacks (the output signal from the dock is shared between the line level output jacks and the pre-amplifoer... bad electronics form, since I'm "trusting" that the (most likely Op Amp based) circuits are properly voltage insulated with capacitors (that is usually the case). But this design defect gave me the opportunity to connect the output of the Bluetooth receiver into the input of the pre-amplifier, this I get a X10 amplification. The result is that teh Bluetooth reciever is now as loud as the iPod when docked in. A little tweaking with a 3rd party equalizer app and I got the exact same sound I gor from the iPod Touch. 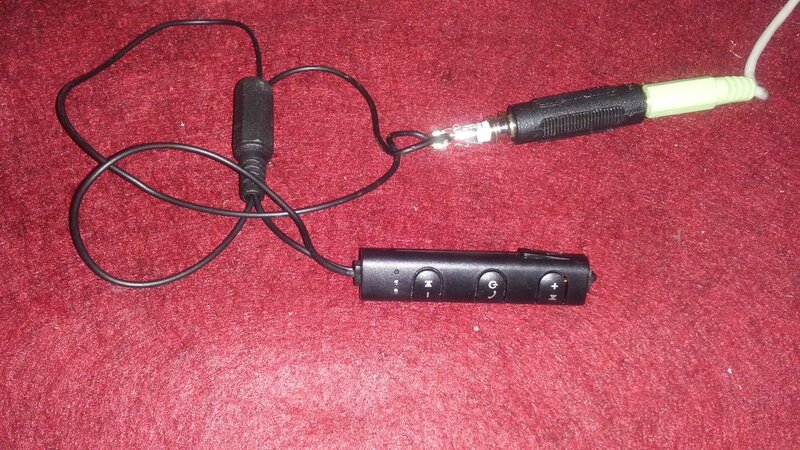 So all I need is to make an external "plug" with the Bluetooth receiver. I guess I could go the extra mile and physically solder it inside the Apple dock and feed power from the pre-amplifier volt supply... But I think a Bluetooth receiver I can plug into any device I want would be more versatile... The battery life on the Bluetooth is not too good though, so that may push me to fully integrate the receiver. It;s so small it's barely noticeable.I can do anything with it. A new boombox will require a quality power amplifier. I have shown the "front end" Bluetooth receiver has a very good quality, so the "back end" of the Boombox now has to be of quality. This is where you start shopping for subwoofer systems. 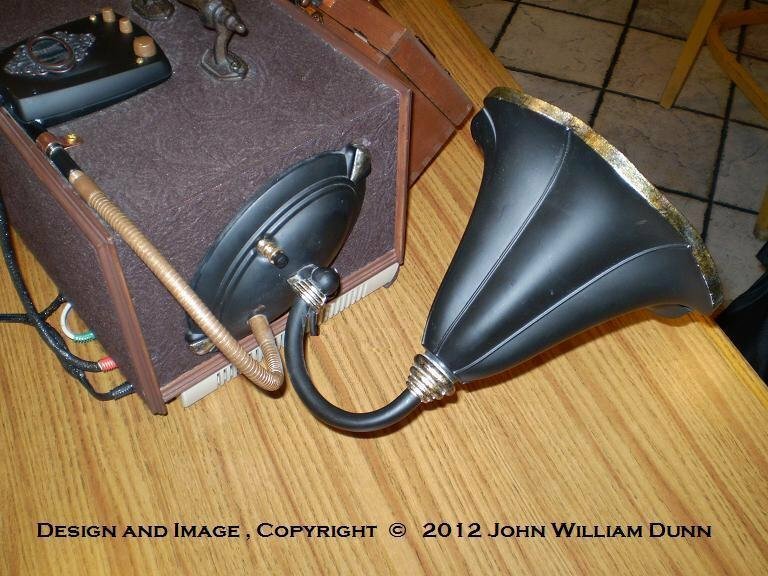 The idea is to get a high quality yet inexpensive amplifier you can buy repeatedly, without the danger of it being discontinued any time soon. Otherwise each boombox would be a "one-off." Nothing wrong with that, but it will jack up the price tag tremendously as I have to hunt for parts and spend time searching over and over. I like recycling and re-suing old parts, but they're also a nightmare. The Boombox sounds great; it's based on an Altec Lansing ACS-340 system (back when Altec Lansing was a high brown brand name)... As long as you don't jiggle the wires too much. It's full of cables and connectors in the back, all of them jiggly. 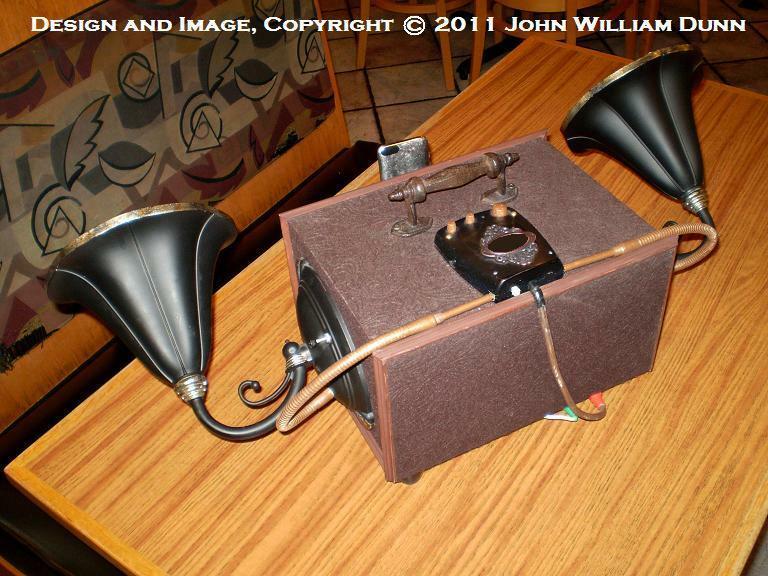 Touch a wire, and the amplifier will give you a nasty shriek or loud "thump" and any of the three speakers will stop working until you jiggle the cables a bit more. It's the DIN type connectors in the back. All the pins are loose. That is one thing that convinced me at some point the Boombox would never sell. It's major open heart surgery to replace all of the wires and connector in the box. You can do great things with old parts, but you're also buying problems. The key is to get all new parts if you can. That is what I did with everything else I made. So the Gen 2 Boombox will not be made from recycled parts. Theres a number of very inexpemsive subwoofer systems out there. The perpetual engineer's challenge - finding the sweet spot between quality and cost. But will not the issue be so much in the modern internals but rather sourcing a supply of appropriately steamy outer casings? How youfind time for thisthis magnificence (begging your pardon, im writing this on my pad from thr hospital) what with all the other stuff going on in your life amazes me. Great work as usual! Mr Bailey! Sorry to hear you're in the hospital. Wishing you a speedy recovery. The boom box was built long ago. 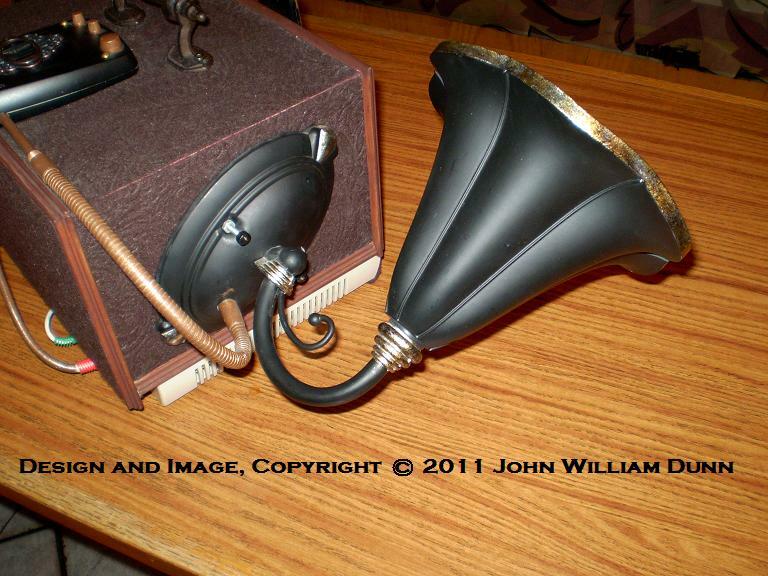 It was present already by the Steampunk Bible release party in 2011, back when I was a full-time Steampunk. I would have a hard time building it today, but my aim is to do precisely that but in a smaller, more modern and practical form. iPhone/iPod no longer has the lion share of the market, and decent Bluetooth sound has made its appearance. So it's no longer practical to use a dock, when $7 can buy you a decent quality Bluetooth adapter which connects to any sound source for your amplifier. I still intend to find a decent speaker system, perhaps an inexpensive Subwoofer system, as that is the centre piece of the puzzle. I'm very sorry to hear that - I hope you feel back to rights soon. That sounds like a jolly good plan; best of luck with the search for the speakers. Also on account that my trusty iPod Touch 2.0 is now broken - still works but the screen is cracked. 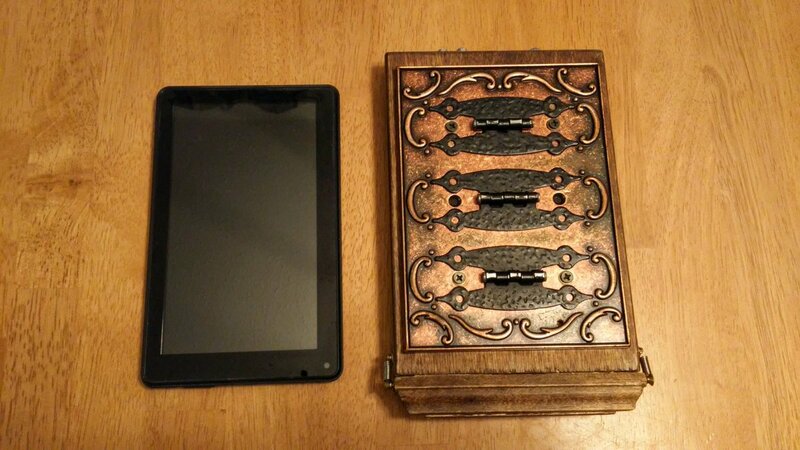 I'm thinking of replacing the front face of the Boombox's dock with the tablet, perhaps held by one of my bumper cases used as a lid of sorts over the iPod dock, It so happens that I made a bumper case just for this tablet when I bought it - only trouble is the case plus tablet weigh a TON). 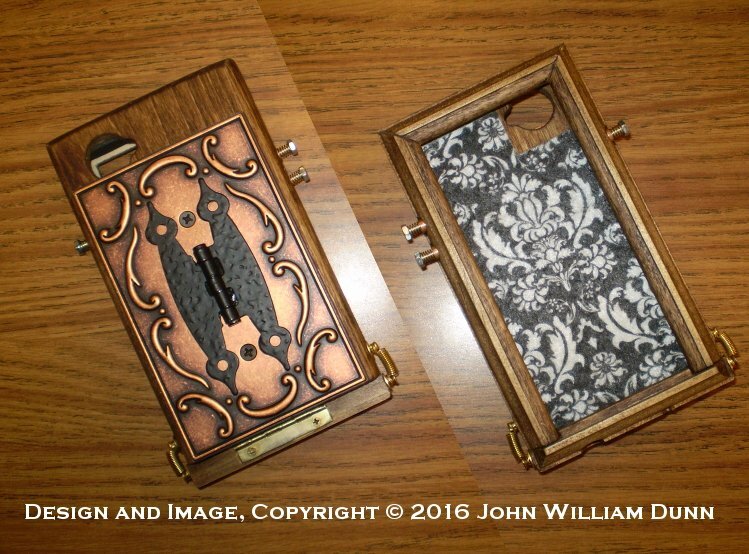 Which is one of many styles of bumper cases I've made before, but in the latest style (2016) which I named " Landau." I think I called it "Irongate" before? Honestly I forget. I'm old! I can't find the posts anymore. The boombox itself, was in fact the inspiration of this new style, and the plates in the back are... you guessed it, electric switch plates with the same black iron hinges I used in the Boombox but by the time I came up with it, the business had all but dried up by about two years and I was too busy working a regular job. Now, what I want is simply to attach the tablet to the front of the dock, with a swing top and a removable case like I used to do with my iPad tablet keyboard cases. 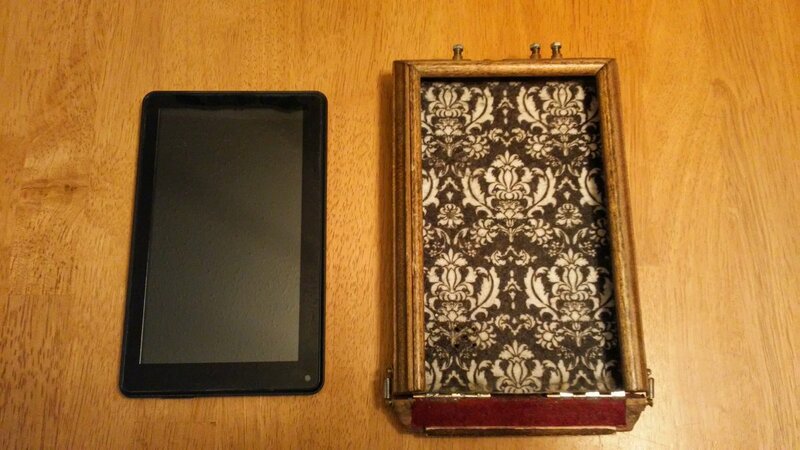 It just happens that the size of the tablet case is nearly identical to the front of the iPod dock shown above. In theory, all I need is to drill some holes into the bumper case and use threaded brass wood inserts and attach with knurled knobs. I'm thinking I'd keep the iPod dock hidden behind it, but nothing would ever dock to it as there are not too many iPhone 4's lying around these days. What I worry about is that the case is ridiculously heavy. 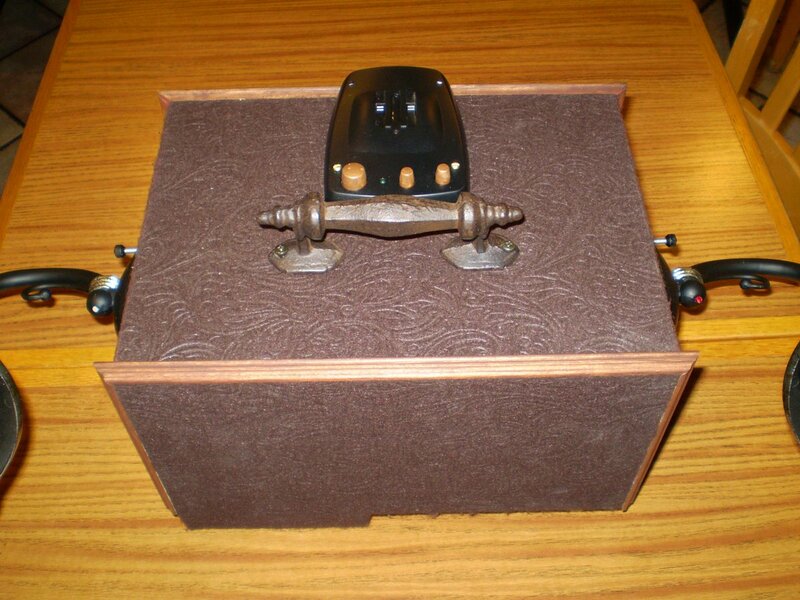 For some reason, the Landau plate is very light for a single toggle switch, but the three-toggle switch plate is impossibly heavy. It's some die cast metal, but you'd think it was moulded out of lead by the way that it weighs. My copperplate backed cases were much lighter!! I might even have enough time to do it in the next few days? What say you? Is this a worthy project? Yea or Ney? In the Era of Bluetooth is this a futile exercise? What would the Viking Harold Bluetooth say? Page created in 0.373 seconds with 16 queries.